This time of year I like to take advantage of the low prices on peppers and prepare a huge batch of Italian stuffed peppers for the freezer. 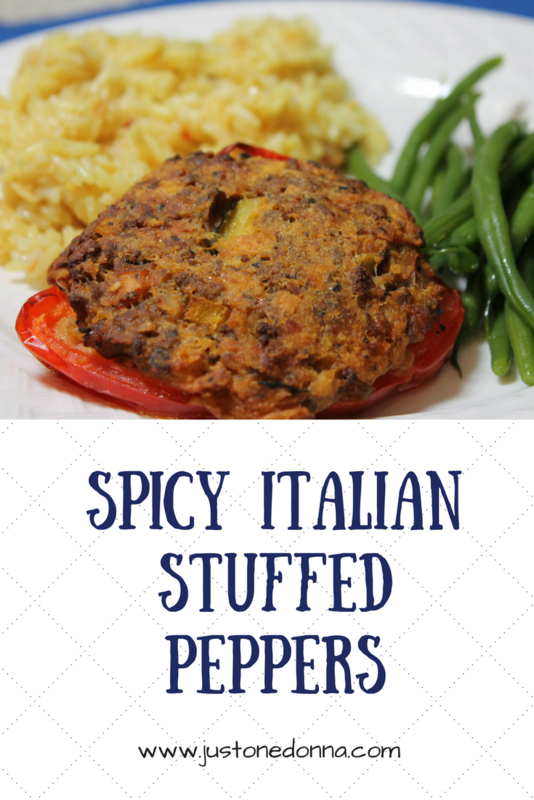 Stuffed peppers are a favorite dinner at my house and you will usually find them on our dinner menu once a week. Having them all prepared, frozen and ready for the oven is a real time saver for those busy days we all have. Make a large batch of stuffed peppers for the freezer. You'll have an easy, tasty weeknight dinner ready to go. Our family's stuffed pepper is one I've written about before. 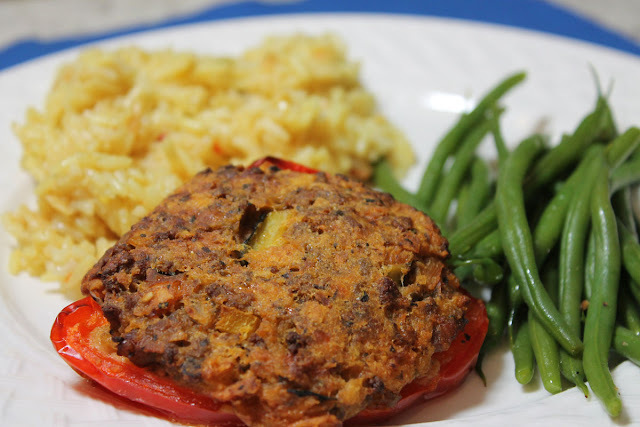 I love this stuffed pepper recipe because it sneaks squash and eggplant into the filling for all those picky vegetable eaters in the family. I also love that the filling is prepared with ground beef and is similar to a meatloaf or meatball filling. Our stuffed pepper recipe came from Hubby's paternal grandmother, Nani, who made wonderful Italian dishes and taught Hubby how to make this favorite dish. Nani's stuffed peppers are a tasty comfort food for Hubby, but while flavorful, they are not very spicy. Occasionally I like to spice things up with my own version of Nani's recipe. The spiced up version of Nani's stuffed peppers is what I'm sharing with you today. Heat the olive oil in a large, deep-sided pan. Add the squash, eggplant, garlic, and onion. Season with one teaspoon of salt and 1/2 teaspoon of black pepper. Saute the vegetables until tender. Remove the vegetables from the pan to cool. Heat the same pan as you cooked the vegetables in over medium-high heat. Add the ground beef and sausage, breaking apart any clumps. Season with one teaspoon of salt and 1/2 teaspoon of black pepper. Cook until the meat is browned and begins to stick to the bottom of the pan. Drain the meat mixture and set aside to cool. Break the eggs into a small bowl and beat slightly to break apart. Mix the squash and meat mixture together. I like to use the pan I cooked them in for mixing so I can incorporate the brown, flavorful bits from the bottom of the pan into the mixture. Add the eggs, tomato sauce, Parmesan cheese, basil, parsley and crushed red pepper, stirring to combine well. Add the bread crumbs and stir to combine. If the mixture seems dry, add water to moisten. Generously fill each pepper cup with the stuffing mixture. If making the stuffed peppers ahead for the freezer wrap each stuffed pepper individually in plastic wrap and then package the peppers together in a large zip closure plastic bag for long term storage. When ready to bake, preheat the oven to 350 degrees F. Place the frozen stuffed peppers on a baking sheet. Sprinkle the tops of the peppers generously with extra virgin olive oil. Bake until the tops are browned and the peppers are soft when pierced with a fork, about 45-60 minutes.